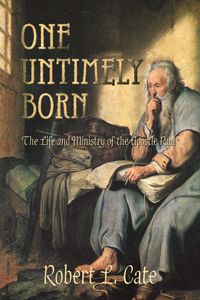 One Untimely Born traces the life and ministry of Paul. Like a modern Sherlock Holmes, the author examines the clues available from the most current evidence in the earliest biblical texts, archaeological discoveries, and histories of the period from the earliest Roman historians through the most recent modern interpreters to set forth what we know about the life and work of Paul. Written by a committed Christian scholar and pastor, the book tells a compelling story about this remarkable man who described himself in his rela-tionship to the Lord Jesus Christ as “one untimely born” (1 Cor 15:8). One of the greatest missionaries who ever lived, Paul was the early church's most signif-icant representative. A major part of Christianity's understanding of the mission of Jesus has been shaped by the writings and influence of this one man and his companions in mission and ministry. In fact, more than one-third of the New Testament is by, dedicated to, or about him. Yet most people—even committed Christians—know surprisingly little about this man. This book presents the story of Paul's life and work in clear, straightforward prose. It establishes a clear and compelling chronology for the major events of Paul's life and resolves some of the enduring controversies about this remarkable man. One Untimely Born reflects the most current scholarship in the field; the author's extensive knowledge of Hebrew and Greek language, culture, and history; and extensive research about geography, travel, and daily life in the first-century northeastern Mediterranean world. It provides a superb introduc-tion to Paul for the serious lay reader, presenting detailed information clearly and concisely. It will also be of interest to those who are intimately familiar with the ministry of Paul, presenting a fresh, stimulating, and thoughtful approach to Paul’s life and ministry.